After the YZF-R15 V3.0, India Yamaha Motor has extended its Darknight colour option to the scooter range. 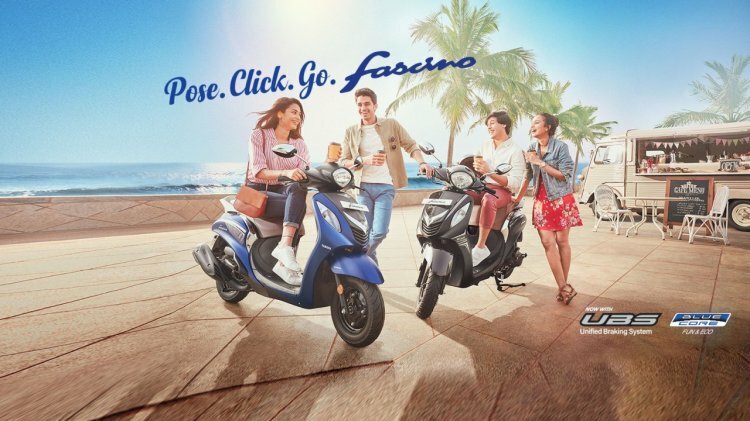 Yamaha has announced the launch of the Fascino Darknight Edition, priced at INR 56,790* – a premium of INR 1,497 over the standard Fascino that retails for INR 55,293*. The Yamaha Fascino Darknight (right) extends the colour palette of the scooter to help it compete against its rivals such as the Honda Activa, TVS Jupiter and Honda Dio among others. The Yamaha Fascino Darknight gets a combination of matte and gloss finish panels with highlights of chrome on the apron and the side panels. Additional graphics further enhance the sporty looks of the scooter while the dual tone saddle adds a premium touch to the package. The Darknight joins the existing colour palette that includes Season Green, Glamorous Gold, Dapper Blue, Beaming Blue, Dazzling Grey and Sassy Cyan. The addition of the new colour option is aimed to help the scooter gain better sales and compete against the likes of Honda Activa 5G, TVS Jupiter, and Honda Dio among others in the Indian market. Apart from the visual upgrades, every other specification remains identical to the standard model. Luggage carrying solutions include a 21-litre under seat storage with the option of adding a USB charger, bottle holder next to the keyhole, and a hook for a handbag near the footboard. The analogue instrument console comprises speedometer, odometer and a fuel gauge along with tell-tale indicators. Technical specification sheet includes a 113 cc, air-cooled, single-cylinder, SOHC, 2-valve carburettor engine with Continuously Variable Transmission (CVT) that churns out 7.2 PS of power at 7,500 rpm and 8.1 Nm of peak torque at 5,000 rpm. Anchoring tasks are performed by drum brakes on both wheels while the safety net includes Unified Braking System, Yamaha’s terms for Combi Braking System (CBS). The Fascino rides on 10-inch wheels that are wrapped in tubeless tyres. The scooter is built around an Underbone frame while the shock absorption department includes telescopic forks at the front and a single spring at the rear. The Yamaha Fascino Darknight carries a premium of approximately INR 1,500 over other colour options. The scooter has been priced at INR 56,793 (ex-showroom Delhi). The same colour option is expected to arrive with the MT-15 that would be launched in India on March 15. The naked roadster will join the YZF-R15 V3.0 in the 150-180 cc segment of the Indian market.